You've probably noticed from the previous post that I enjoy sewing. Well, the kids always want to "help" or join in, so usually any sewing I do has to wait until they are in bed. I just figured out putting together a little kit for them to sew along with me. They are only just four, and two and a half, so I'm not at all prepared to give them needles, even the larger plastic ones I have for my knitting, because they have an extraordinary ability to do illogical things with the wrong tools that would test even the most robust health insurance. With that in mind I cobbled together a load of stuff that they could sew/weave, without maiming themselves or each other. Lots of this stuff was found in Goodwill and Savers, but a lot was also random stuff from around the house. The lovely wooden teddy/fish/dog threading panels were a present from one of our friends back in the UK. The plastic punnets that you get berries in work well too for weaving and a random odd jelly shoe (no idea where the other one got to). 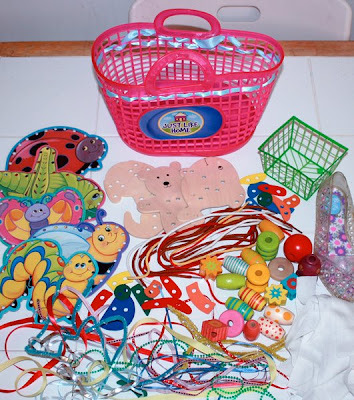 Bits of rags, shoe laces, ribbons, pipe cleaners. 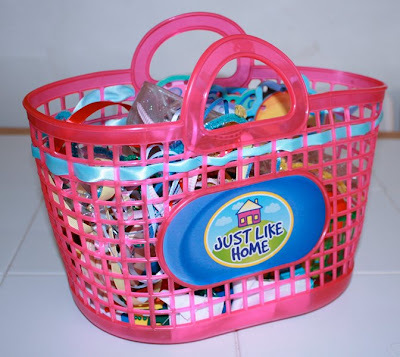 It all fits nicely in the plastic tote, that can also be woven (50c from Goodwill! I love Goodwill). It's been a big hit and a really really cheap present for them that they can play with together. I was going to save it for Christmas, but we've had 2 weeks of illness in our house and quiet time play things were badly needed. I saw on a blog, My Montessori Journey a tip. 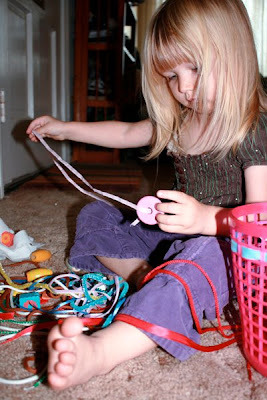 Use hair clips to clip up the thread etc to stop it getting all tangled together. That is such a cute little bag! I have a kid like that. It's like "oh hi mom your doing something well how dare you! I am just going to go ahead and stick my head right in what your doing" I can hardly breath until he is in bed sometimes ugh. fantastic gift idea. I was just looking to do something like this for my 4 year old neice who wants to sew because her mom does. Thank you for your great ideas! 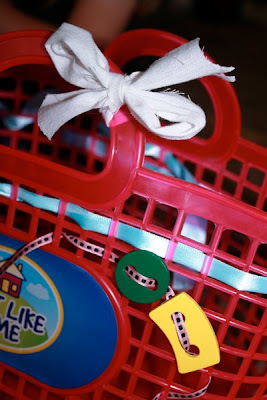 I love it so much that I made a post on my blog The Bibirays Bitsi Muses, of my own version of your preschooler sewing kit.